A global, collaborative effort led by the Earlham Institute, UK and CIMMYT, Mexico sheds light on the genetic basis of biomass accumulation and efficiency in use of light, both of which are bottlenecks in yield improvement in wheat. Wheat is responsible for half of global calories consumed either directly or as animal feed and we need to make a lot more of it in the coming decades. Now, an important paper marks a step change in how breeders might approach wheat breeding using previously untapped sources of variation to increase yields to meet demand. The recent paper, “Elucidating the genetic basis of biomass accumulation and radiation use efficiency in spring wheat and its role in yield potential”, first-authored by Dr Ryan Joynson of EI’s Anthony Hall Group and Dr Gemma Molero of Matthew Reynold’s team at CIMMYT, presents a valuable step forward for researchers interested in increasing wheat yield potential: a crucial task if we are to sustainably feed the planet. The research, funded through IWYP (International Wheat Yield Partnership) shines light on the role of radiation use efficiency (RUE, how sunlight is converted into plant mass) in increasing the yield potential of wheat: how we can increase plant biomass without sacrificing grain yield - a major challenge. Thanks to Norman Borlaug’s green revolution, led from CIMMYT, the development and improvement of dwarf varieties of wheat have led to a drastic increase in wheat yields over the better half of the 21st century. Yet, this consistent increase has wavered in recent years. Continually increasing wheat yields is challenging, increasingly so when we must more-than-double them if we are to sustainably feed 10 billion people by 2050, half of whom will rely on wheat as a staple for bread, noodles and more. At current rates, we are predicted to only get to 38% increased wheat yields by 2050, which would mean a significant shortfall. The challenge is the well-known trade-off between things such as grain weight/number and biomass. How do we reduce the leafy portion of a plant, or the underground portion, enough to boost harvestable product such that other aspects, including radiation use efficiency (hence photosynthesis) and nutrient uptake, are not disrupted or diminished? Alternatively, how do we increase biomass and the relative efficiency of photosynthesis, without reducing the harvestable portion of the crop - the grain? Photosynthesis itself is pretty inefficient, so it must be possible to find a happy medium between less biomass, more grain, and more efficient photosynthesis - so where better to start than to identify genes and genetic regions underpinning all of these traits in elite lines of wheat? By growing 150 types of wheat, then mapping the differences in growth to differences at the genetic level, it was possible to understand areas of commonality in desired traits for crop improvement. Through analysing new variation in elite wheat lines, while looking for the genetic markers underpinning and linking traits such as radiation use efficiency, biomass, yield, grain number, grain weight, etc., the researchers have provided an important resource for scientists and breeders to exploit. Namely, markers for use in marker-assisted breeding, that will help increase desired outcomes - such as biomass, thousand grain weight and radiation use efficiency - while avoiding the trade-off between grain weight and grain number, or between biomass and harvest index. The study represents the completion of two years of work looking at 150 wheat varieties, using a genome-wide association study to analyse 31 different traits. Among the genetic regions identified, several were found in specific regions common to grain yield, biomass and radiation use efficiency. Another important aspect of the work was the investigation of the effect of sources of new variation into elite lines of wheat. 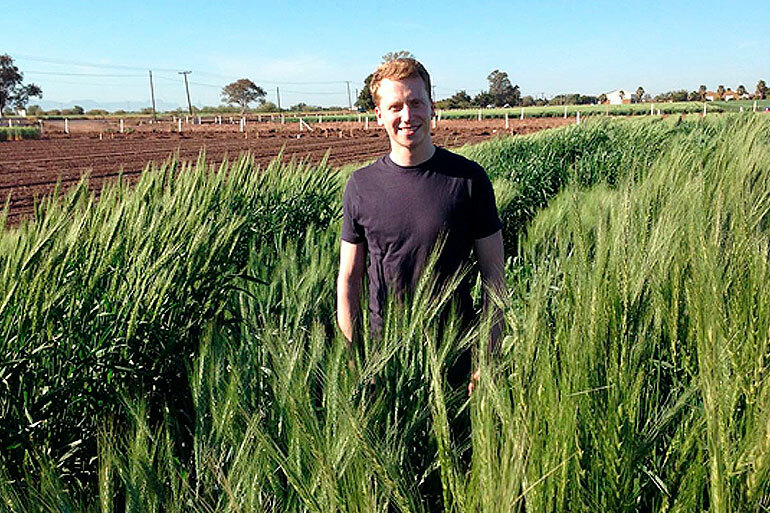 Comparing elite wheat varieties alongside “exotic” lines such as landraces and synthetic wheat, the researchers pinpointed areas of interest for future breeding programmes, i.e. where we can introduce more variation into our best wheat varieties for desired outcomes.